Spray 3 1/2- or 4-quart slow cooker with cooking spray. In large bowl, mix beef, bacon, bread crumbs, onion, milk, egg, honey, grill seasoning and salt. 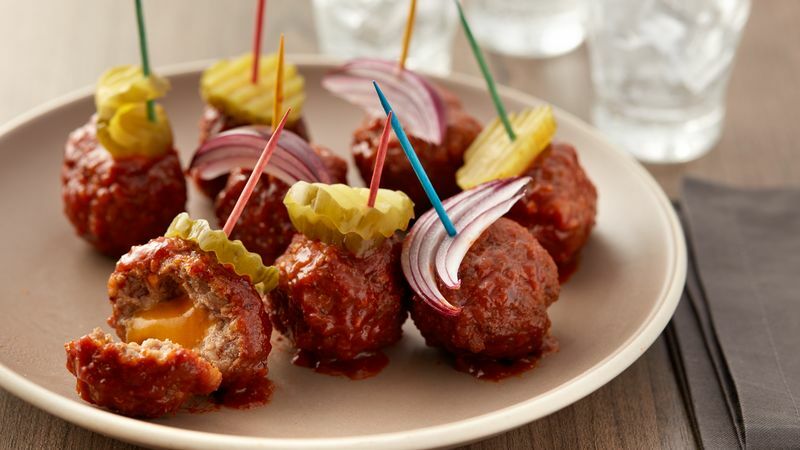 Shape into about 24 (1 1/2-inch) meatballs; tuck one piece of cheese in center of each meatball, and seal completely. Add meatballs to slow cooker. Add barbeque sauce, and gently turn to coat. Cover; cook on Low heat setting 3 to 4 hours or until meatballs are thoroughly cooked (165°F); stir. Thread pickle slices on cocktail picks, and serve with meatballs. Like it hot? Use spicy pickle slices instead of bread and butter. Serve with more burger toppings for extra fun: cherry tomatoes, sliced red onion or mustard.